Last summer, I met a new client who told me an old story. She had stuff in a box and didn’t want to move that box around anymore. She wanted to do something with the contents of that box that she could enjoy and that would honor the former owners of the artifacts in the box. Does that sound familiar? So, what was in the box? 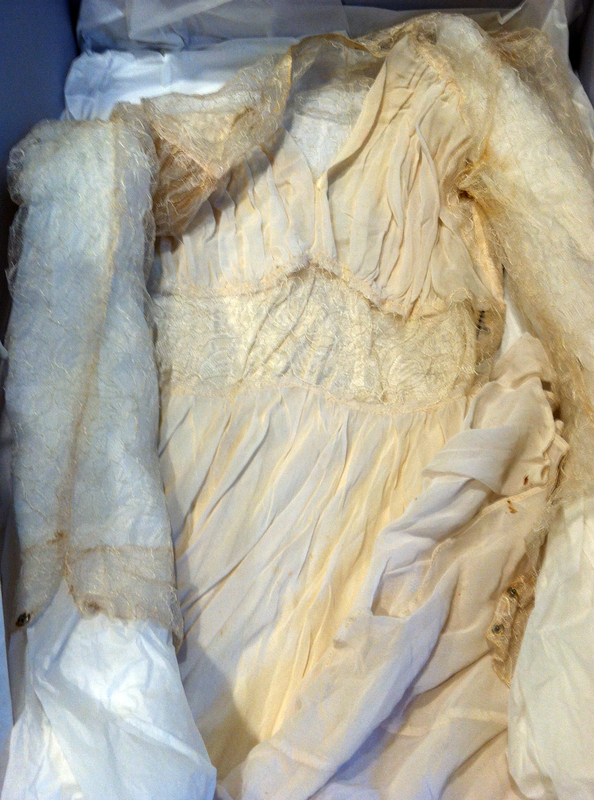 Three generations of wedding gowns, carefully wrapped in tissue: my client’s wedding gown from the 1970’s, her mother’s wedding gown from the 1940’s, and her grandmother’s gown from around 1910. Working within the confines of a 24″ wide by 36″ long size for the quilt, I needed to use the wedding gowns in a way that would visually feature and honor all three in some way. My client told me it wasn’t immensely important for her to be able to see her 1970’s gown in the finished quilt, but she really did like her braided belt. We agreed that her grandmother’s gown was the most interesting and should be showcased. 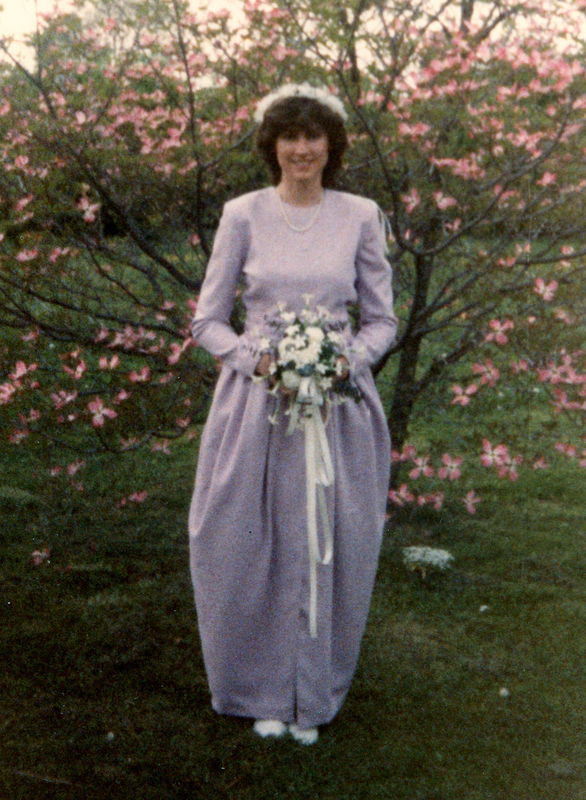 Her mother’s gown was lovely and handmade, and had features I wanted to highlight. To design this quilt, I used my Celebration Quilt worksheet to determine color, pattern, materials, techniques, and to make other design decisions. (If you own my book Creating Celebration Quilts or have taken this workshop, you have this worksheet.) While we quilters often think of quilts in terms of strips or blocks, I approached this quilt with layers as my goal. Each generation would have its own layer. 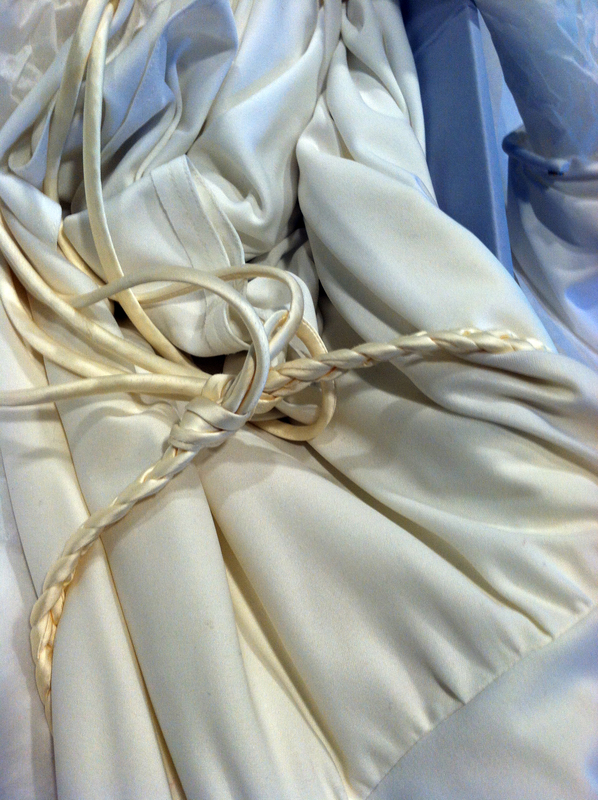 My client’s wedding gown was made of a white knit, which gave me the additional challenge of stretchy fabric. To create a base layer for this quilt, I found an appropriate backing, added batting, and basted fabric from the skirt of the 1970’s gown to this quilt sandwich as if this gown were the quilt top. I grid-quilted it on my BERNINA 820 at 1 1/2″ intervals to keep the knit stable. Everything else in this quilt would be appliqued to this foundation. Let me just pause for a moment and say how very hard it is to cut — yes, CUT — vintage garments. Here’s what I tell myself: This garment is beautiful. It lived a wonderful life and is now in a box where it gets no use, has no exposure, brings no joy. If I cut this garment and make it part of something else, it will have a new life where it will be seen and appreciated every day. My client’s mother’s gown was really special. It was hand sewn from silk and lots of really lovely lace. 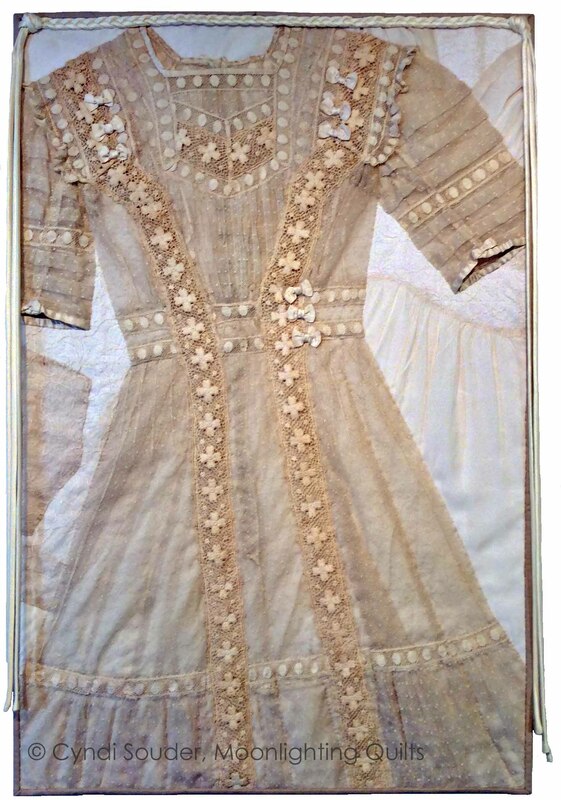 I wanted to include it so that you could see it was still a dress, but there wasn’t enough real estate in this quilt to highlight both the 1910 gown and the 1940’s gown. I removed the lining from the 1940’s gown and auditioned several layouts that would show the bodice clearly. I also wanted to highlight the points at the cuffs. My client’s grandmother was tiny. Her wedding gown looks child-size. Every detail was well-preserved and, well, beautiful. I couldn’t fit the whole gown on the quilt (If I could have changed the quilt size at this point, I would have.) and I hated to lose any of the gorgeous lace detail. I started by removing the lining and then I positioned the dress on the quilt without cutting away anything. I tried placing it vertically, parallel with the sides of the quilt, but that made for a really boring composition. Then, I tried angling the dress to the right and to the left. The diagonal line made the quilt much more interesting and it left some room to the right to show off the 1940’s lace bodice. Once I knew where everything would go, I pinned things firmly in place and then hand-appliqued everything to the base layer. Where there where big expanses of gown between the stitched edges, I followed the lines of the lace or construction and added more hand-stitching to keep things flat and secure. Once everything was in place, I trimmed the quilt to size and bound it. To add a little contrast between the binding and the quilt itself, I added a line of Aurifil’s new cotton floss hand-couched in the ditch. It’s subtle, but I think it was an important addition. Finally, I added my client’s braided silk belt. This was what she loved about her gown and I wanted it to show. I handstitched it across the top and left the ends to hang free, framing the other two gowns. When I make a Celebration Quilt for a client, I try very hard to use only the materials they supply. Everything in the quilt should be infused with meaning and memories. The only fabrics I added to this quilt were the binding, the backing, and the fabric for the printed labels. Don’t forget the back of the quilt! When I have artifacts or leftovers that would not fit on the front of a Celebration Quilt, I try to make them work on the back. 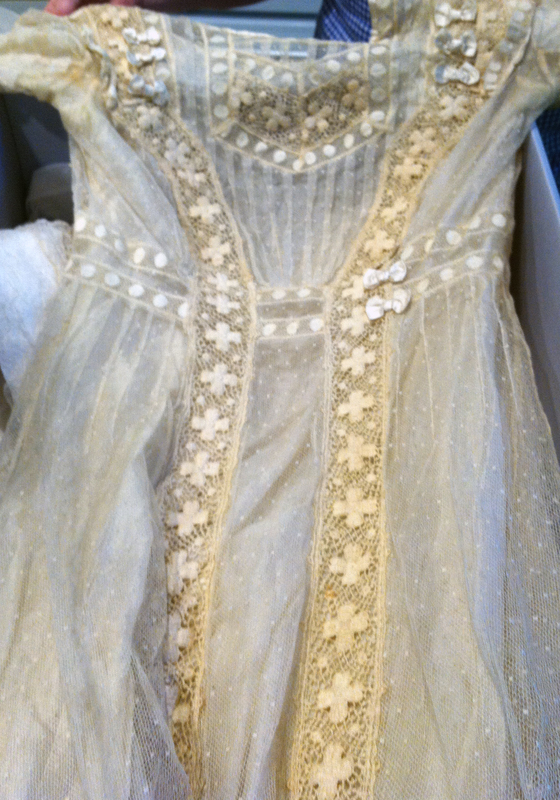 In this case, I used the lace points from the 1910 gown to highlight the labels. Because the quilt was somewhat unbalanced weight-wise, I added a second sleeve at the bottom for a thin metal slat or drapery weights to help the quilt hang perfectly. This quilt needed three labels to tell the whole story. This quilt has three labels. 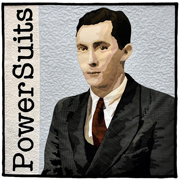 One includes the name of the quilt and information about how it came to be. The second label includes pictures of all three brides, including names and dates. 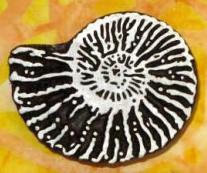 The third label includes the anatomy of the quilt, showing a picture of the quilt with arrows identifying what artifacts are where. This is a good idea any time the artifacts may not be obvious or the quilt may eventually go to someone who would not recognize the contents. This quilt may not be for everyone; it’s not supposed to be. My client is happy. She has hung this quilt in her new home where she can enjoy it every day. 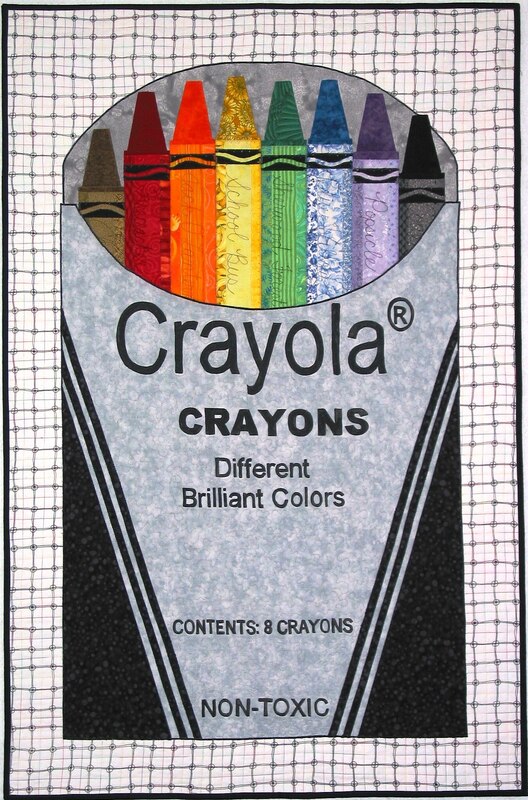 An effective Celebration Quilt is personal and meaningful — and designed as a one-of-a-kind piece of art. If you are interested in learning how to make Celebration Quilts, you can buy my book or come to one of my workshops. If you bring the seed of an idea, I’ll help you make a plan. If you want to talk with me about making a Celebration Quilt for you, e-mail me and let’s start the conversation. A while back, I received an e-mail from a prospective client asking if I’d be interested in creating a wall quilt from a logo she had already commissioned from a graphic designer. She was building a mountain home – a dream home, really – and was celebrating this event with artwork. I don’t usually create art quilts from other people’s designs, but I met with her, liked the design and the client, and took the job. Lesson 1: When a door opens, you don’t have to go through it. But it’s a good idea to look through the open door to check out the opportunity. The logo artwork was a line drawing with a basic color palette. 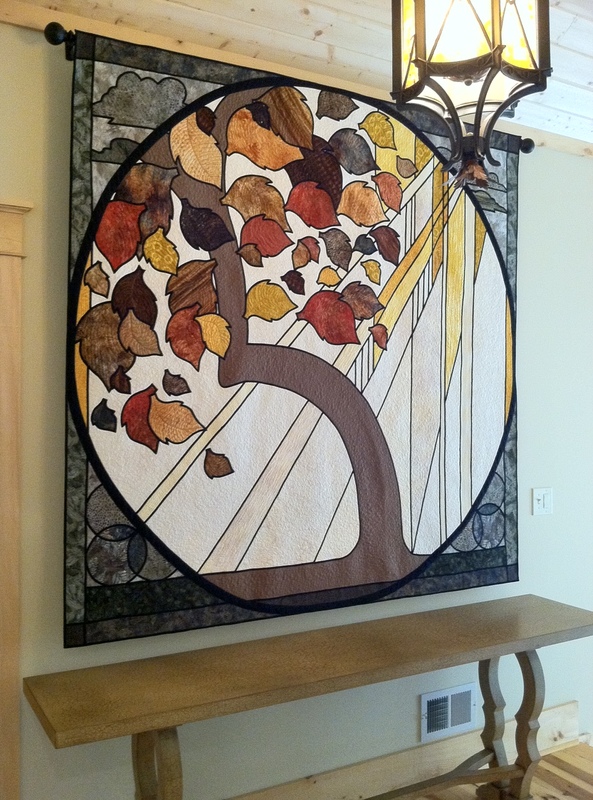 The client wanted the resulting quilt to be prominent in her new home. She wanted it to be big – 9 feet by 9 feet big. I work in a small studio with no room for a quilt that size to hang during construction. We settled on 6 feet square, which still felt like a monster size. In fact, I needed to construct a portable design wall to accommodate the project, but it was doable. Lesson 2: Don’t be afraid to negotiate. Negotiation isn’t a dirty word and it doesn’t always mean that someone’s trying to take advantage. This negotiation helped me set limits and contributed to the overall success of the project. Working within the color palette, I gathered fabrics. Too many fabrics, really, but it was good to have choices. I spent a lot of time collecting, auditioning, and selecting fabrics from a wide array of sources. I used commercial cotton, batiks, raw silk, and rusted fabric. In art quilt class yesterday, one of my students was talking about a recent quilt and said she had been a slave to one of the fabrics, changing every other fabric to try to make the piece work but clinging to this one special fabric. Finally, she realized she had to jettison that one problem child fabric and the piece came together. Her experience sounded familiar. The fabrics for the borders and corners of this piece – the browns and greens – gave me fits. I had one or two fabrics that I thought were perfect and I clung to them. In the end, I had to give them up and that helped break through my quilter’s block. Lesson 3: Make decisions but be open to changing your mind. Not all decisions are good ones, and you may not be as stuck as you think you are. Just because something looks great in one context doesn’t mean it will work well somewhere else. This quilt was the hardest wall quilt I’ve ever made. I could go on about how the circle in the square layout gave me heartburn or how the miles of handmade bias binding took forever to make or how moving the piece from the design wall to the sewing machine caused the pinned pieces to shift, forcing me to hand baste every piece in place. All of these things are true, but every project brings challenges. So what made this piece so difficult? Fear. When I take on a project, it never occurs to me that I might not be able to successfully complete it…until I’m knee-deep in alligators. This piece was bigger than my typical work and that made the challenges seem insurmountably bigger. I was in an almost constant state of fear that I would not be able to complete this art quilt as I had envisioned it. If you know me, you know that I’m a bit of a perfectionist. Usually, that works for me, but not for this project. Lesson 4: Work hard and trust your instincts. If you’ve honed skills over decades of education and experience, trust that you have the tools to identify problems and that you will find a way to resolve any issues. Get out of your own way and do the work. It really will all work out. When the quilt was completed, my husband and I took it to the client’s newly completed mountain home and installed it. Through the entire ride to the client’s house, I worried. Would she like it? Would it be good enough? Would it hang flat enough? Would the rod I chose fit with the rest of the house? Would, could, should. When it was time, I unrolled the quilt on the floor and held my breath while my client took her first look at her new art quilt. I needn’t have worried. She was happy, I was happy, and I felt myself release more tension than I knew I had been carrying. We crouched around the quilt as I pointed out special fabric choices and showed her where I had made quilting decisions to commemorate aspects of her house and its construction. She was interested in as much information as I could give her and I was bursting at the seams to share every detail. Lesson 5: Outcomes are often much worse in your imagination than in reality. I had imagined the worst. What if she hated it? What if she didn’t love the colors I used? What if, what if, what if? In reality, she loved it. We artists are a fragile bunch, at once proud of our work and fearful that no one will like it and, by extension, us. I’m not sure how to change that in myself, but I hope my awareness will help boost my confidence. I’m working on a new commission now for a different client. 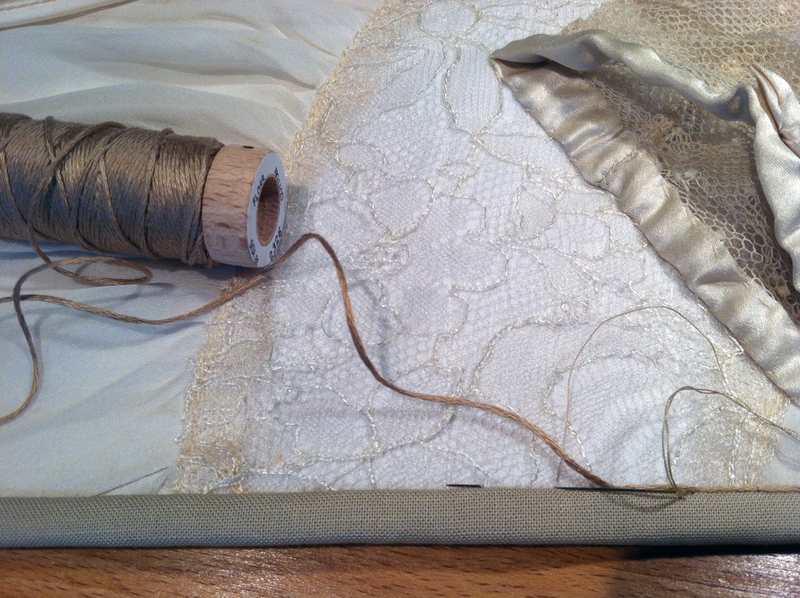 When it’s completed, I’ll post about this art quilt of three generations of wedding gowns. For now, let me say that I’m keeping an open mind through the process, trusting my instincts, and trying not to worry about how the client will react. I’ll cross that bridge when I get to it. This is the first stop on a 10-stop blog hop exploring how quilters and sewists got started quilting and sewing. The complete list of blogs with links is at the end of this post. I cannot remember a time when I didn’t sew. Whether I was pulling yarn through fabric with a fat, blunt needle or making simple clothes for my dolls, I’ve always worked with fabric to make things. The girls in my family all learned to sew on Mom’s Singer sewing machine. Sewing was a useful skill, and we mastered that along with vegetable gardening and basic cooking. Through middle and high school, I wore some really embarrassing homemade clothes. Tim Gunn would have said they looked like “Happy Hands at Home,” but I was so proud of my creations. In the early 1980’s, my sister Vicki learned quilting from a friend of hers. Her friend would accept no money for the lessons; she taught quilting on the condition that her students would teach others. Pay it forward. Everything was done by hand with modern tools like sandpaper templates, sharp pencils, and scissors. Vicki and I shared a love of needlework. As soon as she learned to quilt, she taught me. My first project was a simple navy and white sailboat pattern made with half-square triangles painstakingly hand-pieced and then hand quilted. I made the block into a pillow and gave it to my sister as a gift. The pillow is long gone with no pictures to prove its existence, but I can present my first quilt as evidence of how much I had to learn. My grandmother made puff quilts; you may know them as biscuit quilts. 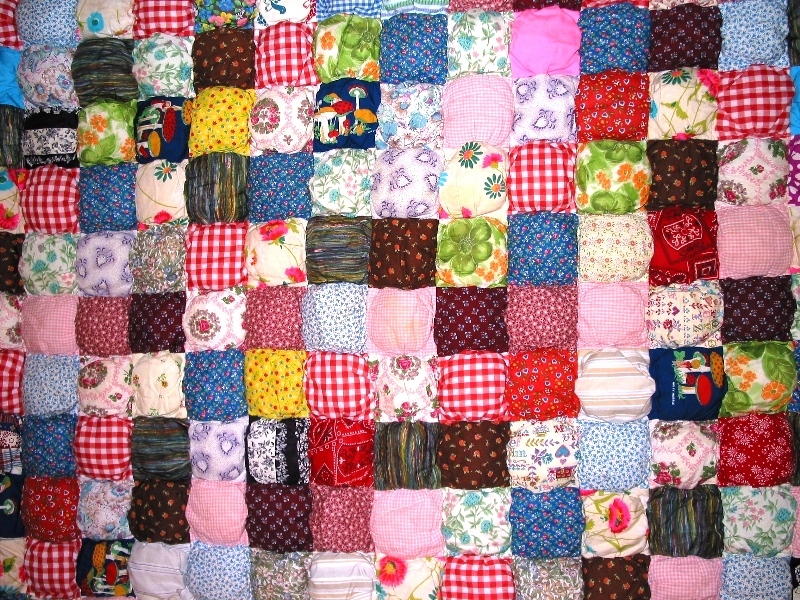 Nana constructed each puff by hand, pieced them together by hand, and finished the quilts by hand. She cut up nylon stockings for stuffing each puff and used worn out clothing and scraps from homemade clothes for the decorative puff tops. She made a quilt for my brother, working long days to finish it. I had never seen anything so beautiful; oh, how I wanted one. Ultimately, I made my own. I learned so many lessons on that quilt: test any pattern changes you want to make, think things through, and plan. My king-sized, flannel-backed monstrosity of a puff quilt weighs more than a bag of potting soil. Enough said. I quickly made the transition to machine piecing and, more slowly, to machine quilting. I took classes that intrigued me and read every book I could get my hands on. I met other quilters and learned something every time we sat down to work together. I had found my people. And I had found my art form. Bodies change and clothing no longer fits; walls don’t outgrow their quilts. Let’s Go! Recently seen at Sacred Threads 2013. Now I am a professional quilter. I make art quilts and celebration quilts on commission. I teach art quilting and I’m inspired by my students every time we meet. I travel to give lectures and workshops, and I teach at the IQA Quilt Show in Houston. 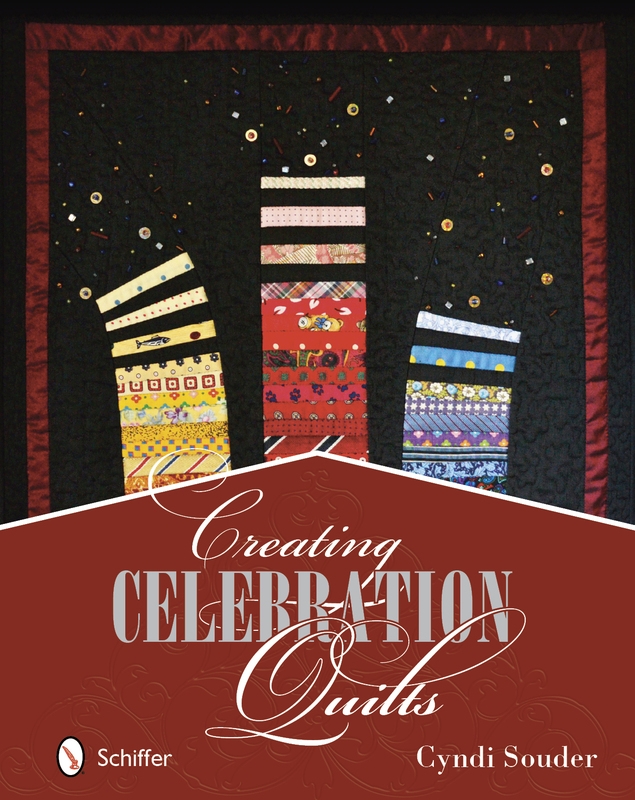 I realized my lifelong dream of being a published author this spring with the publication of Creating Celebration Quilts. If I had a week with no responsibilities, I’d quilt. Whether I’d attack my pile of UFOs or start something new, I don’t know. What I do know is this: quilting calms me, excites me, fulfills me, and makes everything right in my world. 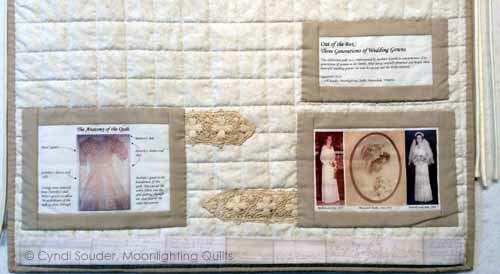 Please visit the other blogs on the tour to learn more about how we become who we are: quilters. I love making quilts that celebrate something — events, milestones, the lives of lost loved ones, or even a special vacation. I relish the design decisions, the fabric choices, the execution, and the joy of seeing the quilt completed. I have made many, many celebration quilts. Some have been for myself, but mostly they have been for others. The Celebration Quilt Worksheet will help you design your Celebration Quilt and offer you things to consider as you work through the process. A Closer Look follows five Celebration Quilts from concept to completion, including quilts made from a commercially available foundation piecing pattern, from a roll of precut strips, from a large collection of bow ties and a bulletin board full of quotes, from tee shirts and traditional nine-patch blocks, and from clothing and artifacts belonging to a spirited man I wish I’d met while he was still with us. The Celebration Quilt Toolbox contains tips and suggestions for taming difficult fabrics, using photographs, approaching the quilting, incorporating quilted words, constructing show-ready hanging sleeves, and adding complete and meaningful labels. The Celebration Quilts Gallery is filled with ideas and inspiration with examples of baby quilts, wedding and anniversary quilts, quilts that celebrate the lives of lost loved ones, and quilts that celebrate family, family traditions, birthdays, accomplishments, events, and travel. When I teach Celebration Quilts as a class or workshop, I am always surprised and moved by the stories I hear. Often, the quilters I meet are planning quilts to honor family members and we talk about the linens, clothing, and collections that have been left behind. Sometimes quilts are planned to commemorate weddings, anniversaries, births, and graduations. 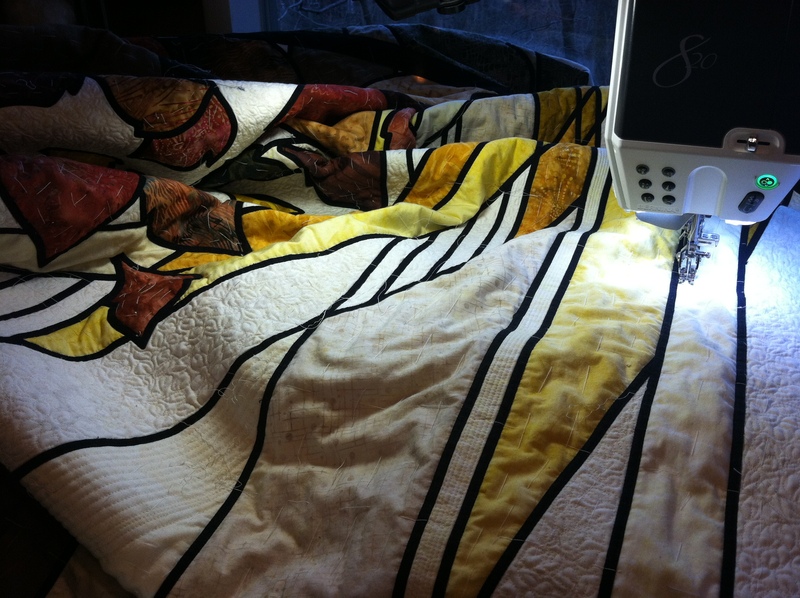 I’d love to hear your stories…what do your quilts celebrate? Leave a comment by Sunday, June 30, 2013, and you will be entered into a drawing for your choice of either a free copy of my book or a free consultation on a celebration quilt you’re planning or working on. Creating Celebration Quilts is available on my website and at quilt shops everywhere. Thanks for visiting my blog. Celebrate with Quilts!